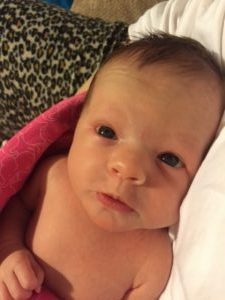 Aubree Faith Phaneuf born on March 26, 2016. She weighed 5 lbs., 3 oz. and measured 19 3/4-inches long. Grandparents are Janine and Joe Phaneuf of Old Forge, NY and Margaret and Jeff Ireland of Spafford, NY. This entry was posted in admin and tagged birth announcement on April 21, 2016 by Gina Greco.